Say goodbye to dropped and missed calls in your home or office! zBoost offers the new zBoost SOHO Premium as the solution to your missed and dropped calls inside your larger home or office space. The zBoost SOHO Premium boosts voice and text coverage for all major carriers. It captures the marginal-to-reliable cellular signal you have outdoors and rebroadcasts it indoors, up to 10,000 square feet. 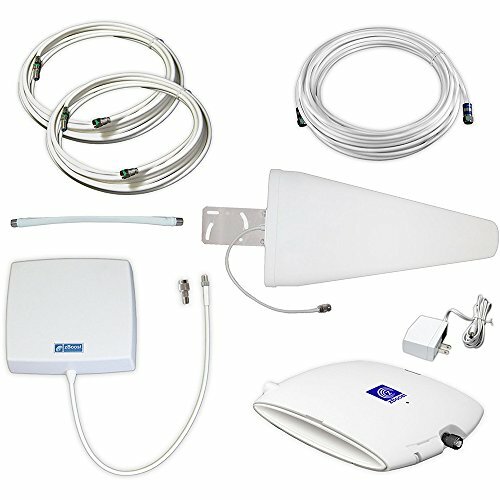 The directional External Antenna receives and amplifies signals from a specific tower for optimal gain. DIY Setup in 4 steps! Mount the External Antenna outdoors or in the attic. Take special care aiming the antenna in the direction of best signal for your wireless service provider. 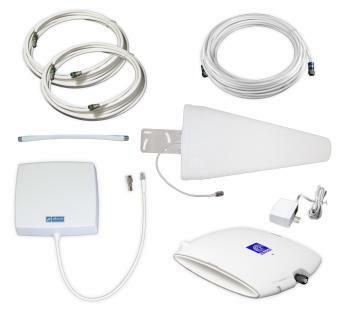 Mount the Indoor Antenna on a wall facing the direction where increased coverage is desired. 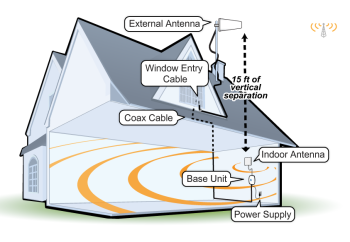 Connect the Indoor Antenna to the Base Unit using the supplied 15 foot RG-6 cable. Connect the two provided RG-6 coax cables (35 feet & 15 feet) using the provided window-entry cable. Use the attached cables to connect the Base Unit and External Antenna through a window, positioning the window-entry cable at the window closing. Connect the power supply to the zBoost Base Unit and plug into a power outlet. Legal Disclaimer: This is a consumer Device. Before use, you must register this device with your wireless provider and have your provider’s consent. Most wireless providers consent to the use of signal boosters. AT&T, Sprint, T-Mobile, Verizon and 90 additional carriers have already given consent for all consumers to use this device. Some providers may not consent to the use of this device on their network. If you are unsure, contact your provider. You MUST operate this device with approved antennas and cables as specified by the manufacturer. Antennas MUST be installed at least 20 cm (8 inches) from any person. You MUST cease operating this device immediately if requested by the FCC or a licensed wireless service provider. WARNING. E911 location information may not be provided or may be inaccurate for calls served by using this device. zBoost SOHO: coverage up to 2,500 sq. ft.
zBoost SOHO Xtreme: coverage up to 5,500 sq. ft.
zBoost TRIO SOHO for AT&T OR Verizon 4G LTE: coverage up to 2,500 sq. ft.
zBoost TRIO SOHO Xtreme for AT&T OR Verizon 4G LTE: coverage up to 5,500 sq. ft.
zBoost Premium: coverage up to 10,000 sq. ft.
Increases signal up to 10,000 sq. ft. If you have any questions about this product by zBoost, contact us by completing and submitting the form below. If you are looking for a specif part number, please include it with your message.